More than 1,500 printed books that once belonged to Richard (1596-1669), Increase (1639-1723), Cotton (1663-1728), Samuel (1706-1785) Mather, and their families constitute the American Antiquarian Society's Mather Family Library. 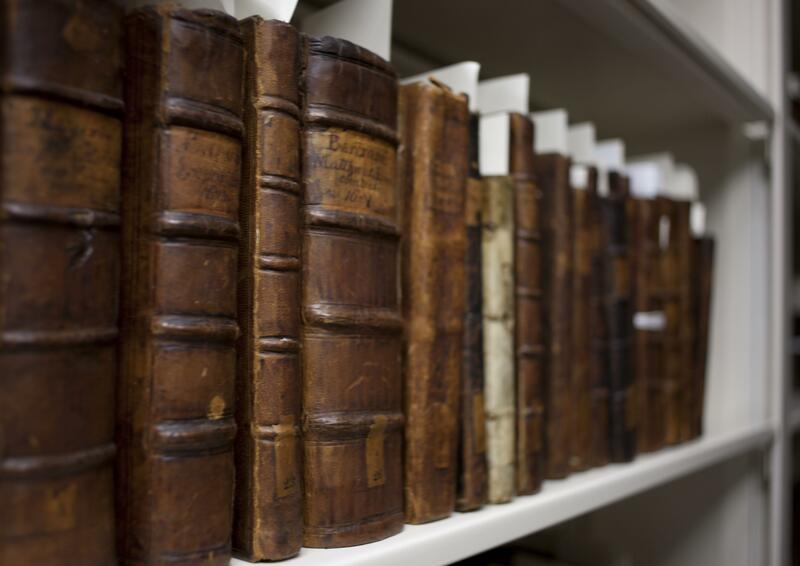 This collection is the largest extant portion of colonial New England's most important library. Within each of these sections, Thomas arranged the Mather books in roughly alphabetical order, generally according to author or title but often according to genre (e.g. sermons) or a capriciously constructed short title. Within the folio & quarto section, there are separate alphabetical series for each format. Thus, Thomas's manuscript catalog comprises three sections, four alphabetical series, as well as a list of manuscripts. Readers will perhaps excuse such detail if they compare this account with the list of books published under the heading, incorrectly transcribing Thomas's words, `Catalogue of Dr. Cotton Mather's Library purchased by Isaiah Thomas and given by him to the American Antiquarian Society,' found at the end of J. H. Tuttle's `The Libraries of the Mathers' in the "Proceedings of the American Antiquarian Society" 20 (1910): 269-356. Here an assistant to Tuttle silently neatened Thomas's catalog into a single alphabetical list, deleting, in the process, more than 500 titles. Gone, for instance, are Thomas's entries for "The Anatomy of Melancholy," Lancelot Andrewes's "The Morall Law Expounded," Ainsworth's "Annotations upon the Five Books of Moses, the Book of Psalms, and the Song of Songs" (1639), among others. Some years after Tuttle glanced over these books, the Society's project to recatalogue American imprints got underway. To facilitate it, tract and sermon volumes in the Mather Family Library that contained American imprints were disbound, their American imprints segregated, and all titles separately rebound. Regrettable from the standpoint of association value, this work was done thoroughly. Only two items were passed over: John Higginson's four-leaf "Direction for a Public Profession in the Church Assembly" (Cambridge, Mass., 1665) and the broadside "Catalogus, eorum qui in Collegio Harvardino" (Boston, 1700). When Thomas's catalogue does not specify the original contents of collections broken up for this project, they can be reconstructed with the help of a nineteenth-century shelflist. Each volume in the Mather Library contains some marginalia; at the very least, each bears Thomas's 1814 appraisal. Signatures, dates, jotted purchase information, or gift inscriptions adorn a high percentage of the books. Claudius Gilbert's "Vindication of the Magistrates Power in Religious Matters" (London, 1657), for example, is inscribed `John Wilsons booke, ex dono authoris,' and `Richard Mathers booke, ex dono Reverendi John Wilson.' "Anti Baal-Berith" is inscribed `Tho: Shepard's: ye gift of Col: Tho: Temple. July. 1661.' Less dramatic inscriptions than these are of course equally pertinent to the study of book circulation in colonial New England. Are the upside-down figures on the flyleaf of Increase's copy of Rivet's "Theologicae & Scholasticae Exercitationes cxc in Genesin" (Leyden, 1633) stigmata earned at Samuel Gerrish's auction of September 2, 1718? Scholars studying the writings of the various Mathers will, sooner or later, find the textual marginalia, underscoring, doodles, and inserted indexes of interest. Read in conjunction with the Mathers' own published writings, with the Mather manuscripts held at AAS, and with the several manuscript booklists compiled at different times by Increase and Cotton Mather, even the shortest dash penciled in a margin points its maker as well as the passage. The marginalia in "A Letter of Advice to the Churches of the Non-Conformists" (London, 1700), for instance, are Cotton Mather's own. It is worth noting that this slender work, in a quite fancy contemporary American binding, escaped the eye of T. J. Holmes, who worked at AAS while compiling his exemplary bibliography of Cotton's writings. Almost all titles in the Mather Family Library have brief records in the General Catalog. Approximately 300 European imprints remain uncatalogued. A typescript of Thomas's manuscript catalogue is available. A card catalog checklist of the collection is available in the Reading Room.